Quartz‘s daily Obsessions e-mail is a rather wonderful thing, in its randomness. Some days, the e-mail gets deleted unread, because I have neither the time nor the inclination to read the subject on offer, and some days I devour it. The fact that’s it’s a deep dive on a completely random subject every day means that it genuinely surprisises me with things I didn’t know I wanted to know. 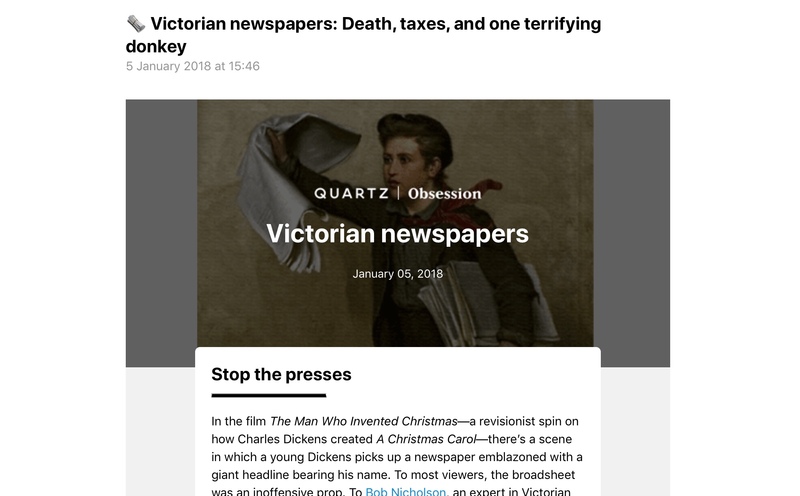 Last week, an issue dropped which will be of interest to many people reading this, I think: Victorian Newspapers. As Nicholson went on to explain, giant newspaper headlines did not exist during Dickens’ lifetime. In fact, the front page of most contemporary papers contained no headlines at all—they were smattered with text-dense chunks of advertisements. Interestingly, it was a slew of 19th century technological innovations and policy changes—the very kind that Dickens loved writing about—that created the paper as we know it today. It’s a lovely piece of context for today’s discussion about the future of newspapers, and a reminder that today’s digital transition is just the latest step in a long process of change and evolution.